In a round-about way my question could be construed as a request for plenty of pics to choose from. Will you include some sort of balancing tool for modders? 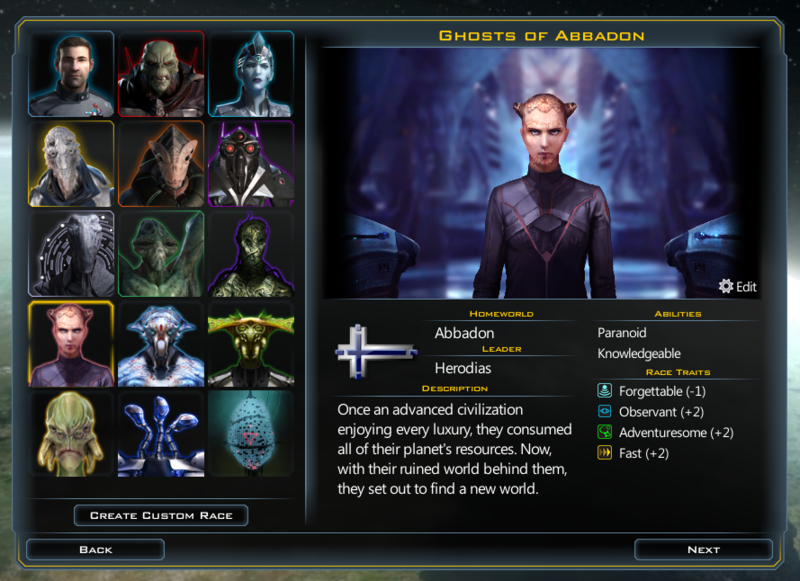 "Your custom race [Ghosts of Abbadon] won 15 of 50 games (above average). 20 scenarios were lost in early-game, 3 in mid-game, 12 lost in late game. Preferred environment: lengthy games, big galaxies. Weakness: Vulnerable in early game. Suggested balancing: reduce point total by 1"
I think the suggested balancing would be really tough to actually make worthwhile. For example, lets say the ghosts was perfectly balanced for arguments sake.... but.... the 3 starting colony ships was massively overpowered or the trouble was in a custom tech tree it used. is it possible to make new 3D models for ship parts and systems? What 3D format you using, and what software is needed to create a new models? What I must do to make a new model? Can you please have a UI modding interface for this like the one in GalCiv 2 for us non-coders out there? It doesn't need to be fancy. WootwooT for customization! Thanks, Stardock! 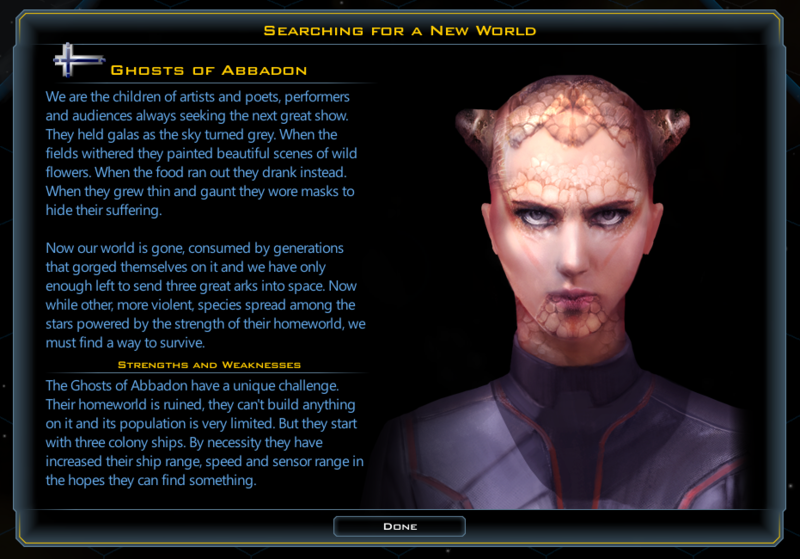 Okay, I started modding a Babylon 5-based race, Zathras (one of my favorite characters). Some of it's working wonderfully, others not so much. Possibly an error in my code. I've attached three screenshots and copy-pasted to .xml for debugging purposes. If there's a more appropriate forum to share this please let me know. Following this guide and the mod instructions text file I assembled to directories properly (in theory) and place the appropriate custom race images in their respective locations (again, in theory). Everything in race selection screen is fine except the background and foreground images (Image 1). 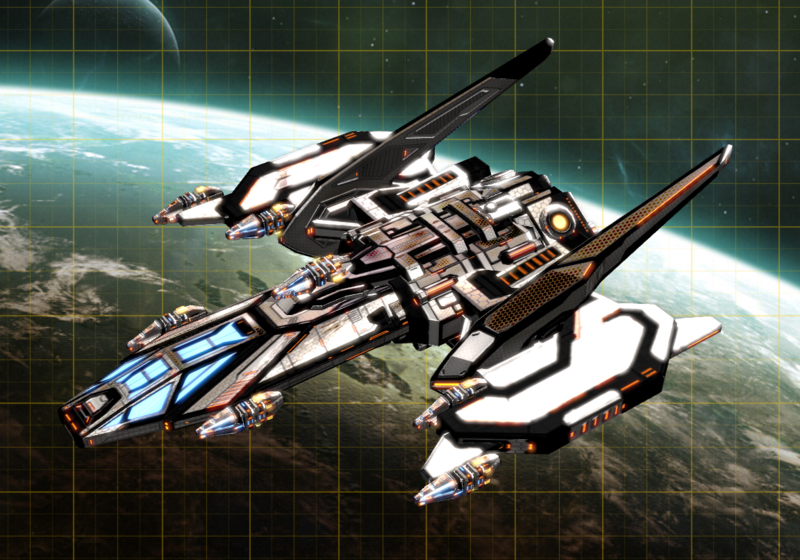 However, if I create a custom race I can choose the correct background and foreground images (Image 2). The startup screen is similar: everything okay except the images (Image 3). Thoughts? Thanks everyone for the hard work and interactions! their mission is It's will ... and yes, that's as cryptic as it sounds. burden to other people's needs. Very sad life. Probably have very sad death. Shoot! Sorry, don't know what happened -- the pics didn't post, just a buncha gunk. It won't let me edit it. Help? Edit: fixed it. Not used to this forum yet. Post edit: I meant, I fixed the previous post, not the issues stated in that p[ost. I see the pictures, very nice! Zathrus is one of my favorites, too. Can anyone start a game with a race added in by a mod? I have used the FactionDefs.XML and the corresponding text files. Everything looks fine in the game Setup, however after creation of the galaxy the game never starts and either freezes or crashes. The same thing happens when I just copy the FactionDefs.XML, rename it and only Keep Terrans in there and rename them. Obviously I am missing something... Are any other files needed except for FactionDefs.XML and FactionText.XML? When I create the exact same race through the ingame methods, I can start a game just fine. You are welcome. Is your new race working in game? My race only works as an opponent, not if I want to play it. Could you please make your files available so that I can compare what stupid mistakes I have made? Yup, got it working in-game. Here's a link to the zipped directory. After you extract it into your \Documents\my games\GalCiv3\Mods\ directory, go to your \Steam\SteamApps\common\Galactic Civilizations III\data\Game\ directory and append both the 'PlanetDefs.xml' and 'StarSystemDefs.xml' with '.1' or some equivalent in order to keep them intact. Edit: btw, this is my first mod. Ever. In the history of existence. Is there a way to mod a galaxy? Say, for example, someone wants to create a custom galaxy with fixed star system points ('Babylon 5' a,d 'Mass Effect' are two examples with locations in specific coordinates and sectors). The GalaxyDefs.xml file doesn't seem to have much room for customization as far as I can see. Is there a different file one could use as a base-line for coding? I created a mod folder, identical to the examplemod. In it a created an XML called FactionDefs_Test. 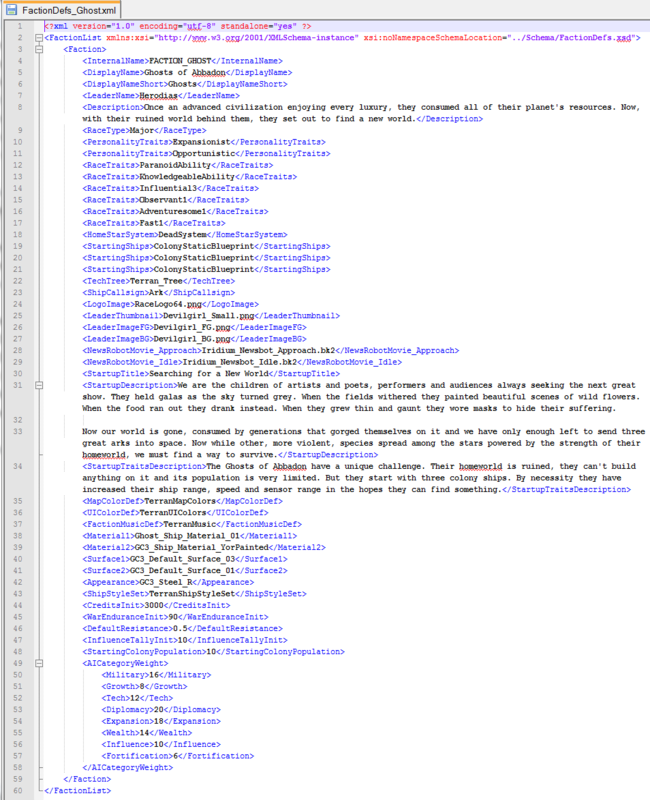 I copied text from the FactionDefs.xml to include the basic tags and the faction info (copied from Terran). I renamed the InternalName to "FACTION_Test" but otherwise left other things the same. That should create a Faction that is just a duplicate of the Terrans, yes? So you created a mod folder Dumhed, did you created the other folders under it and put your file in the mod\Game\ directory or just in the mod\ directory. It's been said that you need to put files in the correct subdirectory in you mod or the game won't load them properly. Also have you created a mod version of the StarDefs.xml with your new start "KonokujaStar" defined in it you have that in the <BodyDef> tag for the star but I think you then need to define in in StarDefs with the same internal name. 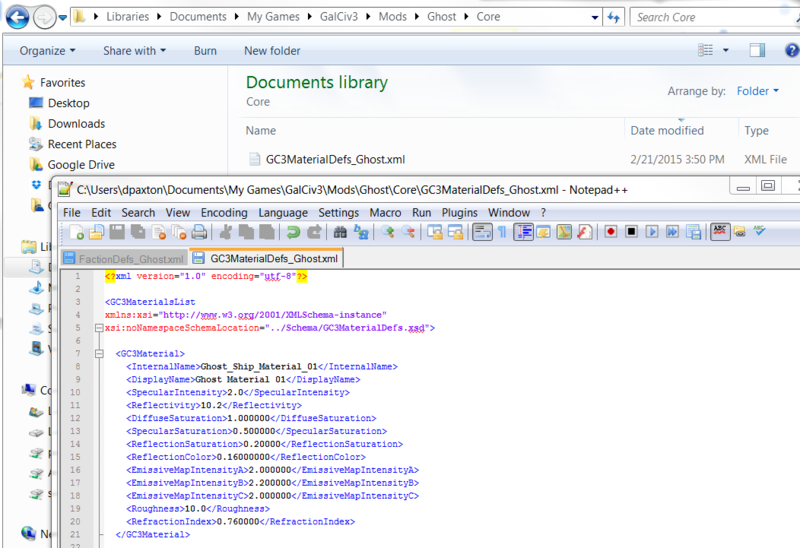 Might be wrong haven't got a change yet to mod the game myself but have managed to look through some of the xml and schemas. Can we get this permanently stickied so players have a tutorial to follow? Now I've tried this myself i am also seeing that my mod races don't appear in game, odd seems straight forward enough but doesn't seem to work. Derek can you post a zip of the Ghost mod so I can try that? if you want to add new pictures for a custom faction do you need a code? also where do i put the art files in the mod folder so others will see them in multiplayer? Here is where they should go download stoneholds custom race to get a feel for how things are handle if you have them there already you may want to make a ticket on it with support. @stonehold I figure it out it was a Blank.png I was using that was working right that i did not know it was .